There are six members of the Gliebers Dresses Executive team. Each team member has a different perspective on the state of the business. Some, like Lois Gladstone (Finance), are convinced that a loyalty program will make a big difference. Notice that most of the Executive team members have not truly played their cards. Glenn Glieber, the owner, said that he likes free marketing. He did, however, rule out aggressive customer acquisition strategies due to a shortage of cash. Sarah Wheldon (Marketing) and Meredith Thompson (Merchandising) expressed their love of catalog marketing, though neither offered a viable solution to return this business to profitability. Both Pepper Morgan and Roger Morgan privately shared ideas with me. Neither leader shared a solution publicly. It is possible that members of this team will not be thrilled with whatever I propose. I cannot do anything about merchandise productivity. I can recommend optimal marketing spend levels. Clearly, the best improvement in long-term profit happens when two strategies are implemented. Dramatically ramp-up customer acquisition spend, especially online, but also in catalogs. Significantly cut back catalog marketing when the customer opts-in to receive e-mail marketing messages. The data suggests that catalogs could be cut back from 24 a year to just 6 a year. The data show that as customers continue to migrate online, they become less loyal. This trend cannot be avoided, it is simply a consequence times that are changing. The data also showed that online marketing synergizes with catalog marketing. 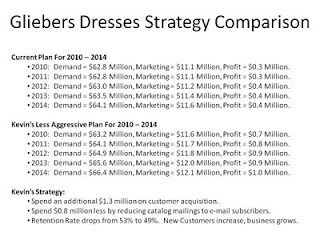 When you send a catalog, the customer uses search to comparison shop, so there is some level of co-dependence between marketing strategies at Gliebers Dresses. There is a belief that shipping and handling fees coupled with an outdated distribution center are hurting customer loyalty. I can run scenarios on what might happen if shipping and handling prices and delivery options are changed, though without reasonable test data, this will be hard to do. What I am going to recommend to the Management team is a solution that represents a compromise between the best strategy (a 50% increase in customer acquisition spend) and the current mindset (reduce customer acquisition spend). Increase customer acquisition spend, per year, by 20%, about $1.3 million per year. For customers with an e-mail address, I will recommend reducing catalog contacts from 24 per year to 12 per year. While I won't recommend it here, profit will undoubtedly increase by adding a second e-mail marketing campaign per week. This strategy increases five-year profitability by $2.5 million dollars (click on the slide above) ... that's a nice return on investment considering that my projects typically cost between $9,000 and $40,000, depending upon the size of the company. This strategy does yield marginal growth, though I doubt the level of growth is going to be enough to satisfy management. At some point, however, there is an opportunity for a 'bigger' discussion. My strategies help optimize the direct marketing contact strategy and the online marketing strategy. My methodologies illustrate where the business is heading. I was able to demonstrate to management that some of their strategies would have had catastrophic consequences, so there is a lot of value in running those scenarios for management. The 'bigger' discussion is about the target audience that Gliebers Dresses markets to, the merchandise assortment, and the tools that Gliebers Dresses uses to market to the target audience. If Gliebers Dresses truly wants to grow and be profitable, then Management will have consider the impact of following the Baby Boomer audience into her 60s and 70s. There are a lot of customers age 15 - 45, customers that have different needs, and are not necessarily as responsive to analog marketing (i.e. catalogs). The latter audience requires a different marketing and merchandising mindset, doesn't it? The 'bigger' discussion is hard to have, because the management team has to fix the business now. The 'bigger' discussion is scary. It requires a thoughtful long-term plan, a re-evaluation of strategy, marketing practices, consideration of demographics, and an assessment of the merchandising assortment. It may require a new customer service platform. It can tear employees away from the jobs they love to do. With those thoughts in mind, I prepare to present the recommended strategy to management.